Let’s talk about how we are driving traffic to our site, and then the new funnel that we are building with Proof Experiences that sends people through the funnel and creates delightful experiences at scale. First, you’ve got to ask great questions and create audience buckets. In this post, we’ll cover all the data you need to gather to create these audience buckets. And, once you have your audience buckets, you can start creating and deploying relevant experiences. When thinking about the data to create your audience bucket, there are really three kinds of data: firmographic & demographic data, behavioral data, and contextual data. Demographic and firmographic data are pieces of information that you can gather from surveys on your site or form fields. A lot of people will fill out this information as they onboard in your funnel. There are also different APIs that you can call to get this info. So, as far as demographic information goes — at Proof, we are creating a service where we capture a lot of data across all of our sites. And with Proof Experiences, we’re now making that available to everybody else so you can call our API. And, they will send back 80 to 100 fields all about who I am, what Proof is, and a bunch of data points related to my firmographic and my professional life. So, it’s not personal data… it’s business data (but data around a person). Another tool you can use is called FullContact, which is a service that we’ve used for about two years now. They grab a lot of personal information and more demographic information about an email. Another data tool that we like to use is called Datanyze. This grabs a lot of software tools and will tell you what kind of marketing stack a certain email address or certain business is using. In 2019, there are a lot of services at your disposal to capture this demographic information to personalize and create experiences from. What is the person doing on-site? What actions have they taken in the past? Is this a repeat visitor? Did they hit certain pages on the site? Did they visit certain URLs? Are there certain kind of events that have triggered throughout their purchase history? Is this person a customer? All of these questions will source behavioral data. The easiest way to define behavioral data is that it’s “data that is based on a visitor’s actions on your site.” It’s the number that you can just kind of grab because they’re on your site, so you don’t exactly have to pay for it. What device are they on? Are they on mobile, desktop, tablet, iPhone, Android? Are they using, heaven forbid, Internet Explorer? Where’s the actual person visiting from? What time of day is it, what day of the week is it, what month is it? All these different things give contextual data. And again, that’s stuff just gets passed in through the browser pretty easily to you. From all of this data, we start to map out what would be the buckets that we want to start to target at Proof. Then we ask, what are the most important segments of visitors that come to Proof? If we could give each of these groups a unique message and a tailored experience, we think that will go well for us, and they will be delighted, and they will be more likely to sign up. The first thing we use to segment our visitors is industry. We basically break all of our different visitors into five main industries. And, these are kind of the five industries that we think of as far as Proof users: Agency, SaaS, Coaching/Course, E-commerce, and other (the bucket that includes, real estate, health & wellness, brick & mortar, etc). Second, we want to target people off of the lifecycle stage in their buying cycle. Are they a first-time visitor to our site? Are they a repeat visitor? Have they registered for a demo yet? Have they started the trial yet? And further, have they converted their trial 14 days later into a paid account? Once we are armed with what industry they are in and where they are in the buying cycle, we go back to our funnel and say, let’s break this thing down and deconstruct how can we make this a more delightful experience. And, so we have this product that we’re in private Beta with right now, called Experiences, to deploy our personalizations at scale. To get started, we ask how can we delight our current customers in some way. Our number one core value at Proof is to be customer-obsessed. When we first started personalizing our site, we said, how about we start with the people that are loyal to us, that have already paid us money, and delight them first? What I’ve noticed is whenever people come back to a site, and whenever I go to a site to go login for some SaaS tool that I use, what do I do? I go to directly to the homepage. An unpersonalized version of the Proof homepage seen by an unidentified visitor. So, visitors go to useproof.com, and then we basically we present them with a standard homepage. We had a standard home page where it just sells them all again, and then on the top right, this little button, says Login. And, I thought this is a pretty bad experience for a current customer. Why do they have to come to my homepage, and see a headline, and see a start trial button, and see all these different pitches for something that they already bought? And, instead of using the whole real estate of the screen, we just use one little inch in the top right. So we said, let’s flip that. A more delightful homepage seen by Proof customers returning to the site. And when they come to the site, let’s actually welcome them back, and use that moment to delight and wow them. Instead of the headline that’s reselling them on Proof, we switched it to this headline. We say, “Welcome back. Thanks for being a loyal Proof customer,” with a little heart emoji. And then, instead of saying, start a new trial, we say login. So, we swap out the call to action, and we just let them login right there. So, it’s letting them know, hey, we recognize who you are, welcome back. And it’s cool for them. And it’s great for us. Once we started doing that, we had a lot of customers reaching out to us, emailing us and saying, that’s a cool experience — it was really nice to see that you already knew who I was. And, again, I don’t have great data as far as how effective is this, or what’s the metric that is moved. But, getting even a few pieces of anecdotal information of customers saying that they like it adds a lot of brand value. And, I think it will help us create more raving fans for the long haul. So, that’s the very first experiment we ran. We said, how can we actually use this data to manipulate our website, and then create remarkable experiences once a visitor is on-site. We had a whole funnel, and we wanted to decrease friction there while increasing new signups. This is basically going go down our demo funnel. So, right now, when somebody comes to the website, they get the standard website. Our headline reads, “Increase your leads, demos and sales by 10 percent in less than 10 minutes.” The call to action is watch an instant demo. So, we wanted to start driving people down that demo funnel right away. So, they click Watch, and it’s a demo. That’s what most people will go do. Now, what we added to our site was a survey, just to ask them what their industry is. At this point, we give them five options, the five industries most of our customers fall into: SaaS, E-commerce, Coaching, Agency, and other. The visitor sees a nice button with a little icon on it. It’s just really easy, really simple. People can click their option really, really quickly. A visitor will just click on whatever they identify with. Let’s say that they click on SaaS, and they said they are SaaS company and go through to the next step, which is step number three. So, at that point, they see our demo registration page, which is a pretty standard demo registration page. We ask for their email address, but we still need to sell them on this instant demo. And so, we swap out the entire page automatically based on the industry that they selected in the previous step. This is the language of SaaS companies. We also have Proof Notifications running on our site, which pops up from the bottom left of the page and says 85 or whatever other number SaaS marketers watched the demo in the last seven days. We are specifically pulling this number for SaaS marketers. Another thing we’ve done on the site is to swap out our testimonial logos. So for SaaS, we change the logos to specifically to show only SaaS logos (rather than any type of business). And then, one of the cool things that we do is we prefill the email address. And so, because we’ve seen this customer on another one of our Proof sites, we will be able to call our own API, and be able to prefill their email address in there. Again, you can also do this with Clearbit, and just based off the IP address, guess who this person is. So, we’ll just enter their email address in there. Then, all they have to do is click the Watch Your Demo Now button. This has been hugely powerful. From our test, people are 54 percent more likely to opt-in on a personalized page just based off industry than they are when our generic registration page. It’s still a highly optimized page, but we saw a massive, massive increase when we started to personalize that page based off of the industry. The page a SaaS visitor sees on our demo funnel. While we’ve personalized the funnel a bit in the previous pages, the video is the same for all the different categories. But the interesting thing is that the context has been set, because the last page was SaaS, because the headline on the video is SaaS, people think it’s perfectly created for their SaaS business, and potentially only for SaaS companies. They think they’ve realized that we can solve their exact pain and we are speaking their language — we are speaking directly to them. This is really powerful. Marketing is all about the framing. We didn’t have to go create all of these different videos — we just quickly changed a few things on the lead up to the video and perception greatly changed. At this point, once someone has watched the demo, we’re trying to drive them to start a free trial. But, a lot of people will leave after watching the demo. They’ll go away and they’ll come back maybe a week later. When they do come back, typically what happens is they come back to the homepage of a site and, it’s just generic again. They’ve kind of forgotten. The company has forgotten who they are. They don’t have them tracked, and they’re not giving them a delightful experience. So for us, what we want to do is save that experience. We wanted to give our potential customer the feeling of being logged into our site before paying us a dime. And so, when they come back now, we keep their experience consistent. 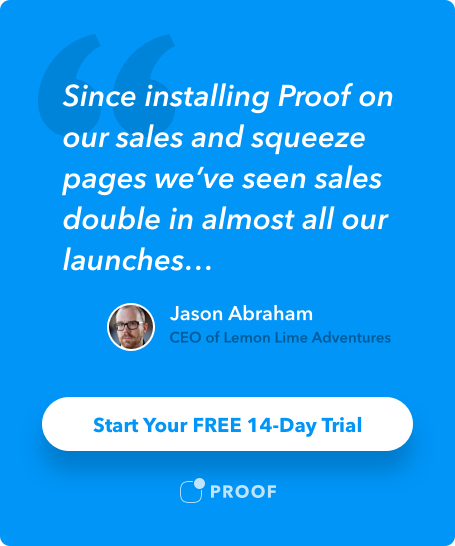 A personalized landing page shown to E-commerce marketers when they return to Proof’s homepage. At that point, what we do — it’s really, really cool — remember, they’ve already watched the demo. And so, why do people drive people back to a demo again? Why would you do that? So, now we’ve recognized where they are in the customer lifecycle. We’ve recognized what industry they’re in, and based off that, we’re manipulating the entire site to create a delightful experience. The next page is personalized, obviously. And so, we changed the headline and featured testimonial on a standard signup page. But, another thing we do is we swap out the testimonial there. Then, we automatically fill in the email address, so all they have to do on this page to start a trial is enter their password and click, Create an Account. And, because of that, we are seeing 54 percent more demo registrations, 27 percent more trial signups, and this thing is working like gangbusters. This is really powerful because you’re treating people like real humans. They have a consistent experience. And, this is something that Amazon and Netflix have been doing for years — this is something that some of the big players have been doing. But, now this is available to startups everywhere, and we are working our tails off trying to launch this product into the market, and really create something that’s truly unique and allows companies to do this. We’re starting to onboard people, we’re working with a few customers really closely right now, starting with B2B SaaS companies. If you’re B2B SaaS — if you have over 50 people, we really want to work with you here right now. Maybe you wish that you were around when Facebook was first launched because you could run all the ads super cheap, or you wish you were around when SEO was just taking off. And, when things were easier on that front. I think this is day one here. People that get in on personalization now are going to reap dramatically different rewards and dramatically more rewards than everyone else that gets in a year or two from now. So, don’t wait on this. The technology has finally caught up, the data that’s available out there has caught up. And, I’d love to work with you and talk with you more about how Experiences can change your business.